There is nothing better than discovering unique, one-of-a-kind architectural pieces that show their life’s journey and imperfections. This once-grand fireplace mantel holds a past and now has a new future. Its new path in life is now my mission for great design. 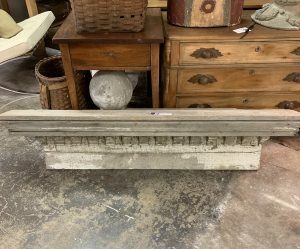 Discovered in Norwalk at the Fairfield Antique Center tucked in a corner, this amazing 100+ year old mantel was waiting for me. It took me under a second to know that it was mine and it was going home with me. Before my car had even cooled down it was packed in the back and on route to Rosebrook Gardens. 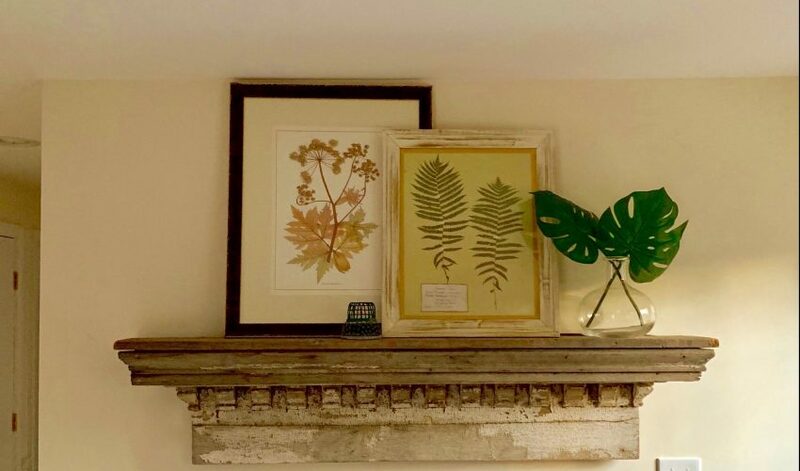 My Casual Luxury brand is all about the magic of the mix and this paint-chipped, distressed fireplace mantel had all the makings to be something special. My core design principle “reuse, repurpose and redesign” is one of the most important keys to creating a space that offers comfort and great style. This fireplace mantel could be the poster child for this simple design principle. Truth be told, I will be featuring this piece for the makeover show on a staging-to-sell episode for season three, and I know this wall detail will be a hit when finally staged and accessorized. I’m sure I will get lots of comments about it and I’ll be thrilled to tell the story on how one late Saturday afternoon in January it became mine. Once Stony Brook Cottage (the name of the listing) is sold, all furnishings and accessories will either be sold to the new buyers or removed, but this one decorative piece is coming back home to me. And what will I do with it? Well, my Garden Studio awaits patiently as this new design detail will be installed in a similar manner, allowing for the perfect intermix with all that represents a well appointed studio. My MARtians, remember these types of architectural relics are too often castaways and forgotten forever, but when you use your imagination to see beyond the distress and imperfections you can create something new again. Just as we are reminded to not judge a book by its cover, remember to look for the beauty that lies inside items. Creating something new with something old is easer than you think when you allow yourself to see—and set free—the possibilities from the inside out.